Is it really possible to make money online using an automated software? This is more or less what Auto Chat Profits claims on their site. But can they really deliver on their promise and provide you the opportunity to earn $423.67 a day? You will be able to answer that question after reading this Auto Chat Profits review because I will reveal to you all the info I got about this program. Hopefully, it will shed some light about the system they use and help you make an informed decision about this product. Auto Chat Profits is a program that claims it can help you make $423.67 a day using automated software. According to its so-called creator, Samantha Smith, the software will do all the work for you, and they are using a done-for-you business model. In reality, using an automated software to create an affiliate site is not sustainable in the long run because you don’t have control over it and it is mostly of low quality. Not to mention the content that the software will generate for your site will be considered duplicate content by the search engines, which in turn will put your site in a risky situation. That’s why I don’t recommend this program because it has several red flags that, in my opinion, makes it a risky investment. What is Auto Chat Profits and what does it offer? The first time I watched their sales video, I knew right away that they are using hype because the narrator claims she doesn’t know how you found their private video. In reality, their sales video is NOT private because anyone can access it and they are not hiding their sales page from the search engines as well; you can search their site using Auto Chat Profits as the keyword. In my opinion, the claims that their so-called private video is hard to find is just to give you an impression their site is exclusive, and you’re lucky enough to find them. Based on the female narrator named Samantha, the system they are selling will have a software that will allegedly build a done-for-you site that can easily make money online through affiliate marketing. Actually, she wants you to believe that their software is the most ideal and fastest way of earning an income online. 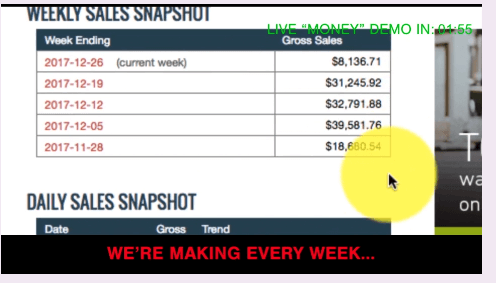 One of the income claims on the sales video. 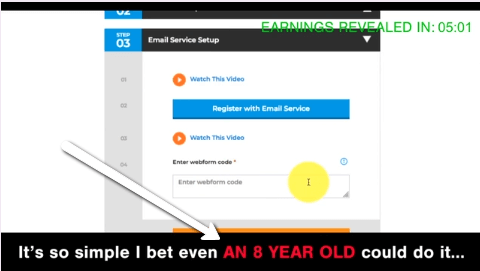 So, the way she presents their product along with the income claims that they supposedly made using the software will sound awesome, and it will even catch your attention. But we can’t really verify if they did earn those profits using the software they are selling. Based on my experience as an affiliate marketer, the claim that you can easily make money online through an automated software is unrealistic, because you will need to invest time, effort and a bit of patience to succeed in this field. After watching the sales video, you’ll get an idea that they are using a done-for-you business model in their program. It’s also clear that the first impression they want to project to their prospects is that their program is beginner-friendly, and it’s easy to use. You don’t need any prior experience in affiliate marketing since their software will do everything for you. So, are these good reasons for you to purchase this program right away? In my opinion not, because you want to get all the details about this program and know if this program is the real deal before investing any money. That is why, I will share with you all the red flags I’ve uncovered from their sales page, so you’ll have all the information you need before you make your final decision. Once you pay the initial fee of $37 to join Auto Chat Profits, you’ll be given access to the members’ area where you will find several instructional videos of how to set up all the things you need for the campaign. Based on their sales video, this program is supposedly easy to set up. Based on my own research, I found out that the first thing they will require you to do is to create a ClickBank account and input all your CB details in their software. After you have created your ClickBank account and found a product, you want to promote, and they will now require you to choose a name for your website (commonly known as choosing a domain name). You will also need to sign-up for an email service that you must connect to their software. After doing all these tasks including the creation of your website, it’s now time to install the chat that will talk to your visitors. Basically, the chatbot is the highlight of this program because it will be the one that will talk to your site visitors and hopefully convince them to purchase the product, you’re promoting on your affiliate site. If your visitors purchase the products through your affiliate link, you will earn a commission. The chatbot will also ask your visitors for their email, so you will also build your email list using the software. Honestly, it doesn’t sound hard to do, but without the technical skills required for these tasks, it will be next to impossible to do. In my opinion, if you’re still a beginner who doesn’t have any experience in creating a website or setting up a chatbot on a site, you’ll need a freelance web developer to do it for you, and that will cost some money. It is, of course, possible to learn with the right training, but you should then be prepared to need more training to make this happen. That is why this program is NOT beginner-friendly because all the tasks you need to do cannot be achieved by a newbie without investing more time or money for further training. So, take this red flag seriously before you decide to purchase this program. 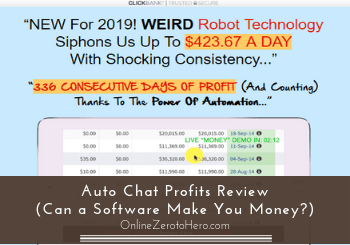 Auto Chat Profits relies heavily on a software to create your affiliate site, so in my opinion, it’s not sustainable in the long run because you don’t have control over it. Their so-called automated software will do all the tasks for you. If you’re still new to SEO (Search Engine Optimization), then you must know that rules are being enforced by the search engines like Google regarding duplicated content, and the impact it has on your site once they found it there. Your site will be penalized if you have duplicated content and it will be hidden from the search results, which means it cannot gather organic traffic and the only way you can have traffic on that site is then through paid ads. Well, paid ads can be expensive and can cost you a lot of money if you do not know what you are doing, and you don’t want that if you’re still a beginner. That’s why this is another red flag that you need to think about before you make your final decision. The spokeswoman on their sales video is named Samantha Smith, but there’s no reference of her anywhere on their sales page. In fact, at the bottom of their sales page, they state they are just using a pen name to protect the real identity of the owner. In my opinion, this is a red flag because they should be transparent enough to reveal who the creators or owners of this program are. As a consumer, you need to know who you are dealing with in any transaction and in the case of Auto Chat Profits, you’ll be buying their program for the sole purpose of making money online. You need to know if you’re dealing with a real person that you can contact if you encounter some issues with their program. As for me, that they are hiding the true identity of the owner is NOT helping them build trust and confidence with their prospect. How can you trust a program to provide you the earnings they have promised on their sales page if they can’t even show you who the real owner of that program is?